Complete paint care kit for all finishes. 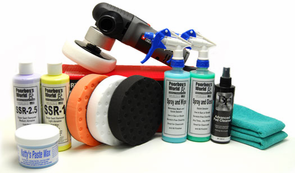 The Poorboy’s World Porter Cable 7424XP Polish & Protect Kit is an all-in-one paint care package for anyone who appreciates the simplicity and success of the Poorboy’s World line of products. All Poorboy’s World products are easy to use in the sun or shade, and by a professional detailer or do-it-yourselfer. The Porter Cable 7424XP is included to make application of Poorboy’s products even faster and easier. Poorboy’s World Light Abrasive Swirl Remover SSR1 removes light swirls, light scratches, and oxidation.This is the most gentle of Poorboy’s four swirl removers. Unique cleaners and nano abrasive powder gently remove mild blemishes from your paint surface without scratching the clear coat. Formulated properly, SSR1 is your best ally against unsightly swirls and scratches. These abrasives are so fine; you can’t even see them with the naked eye in the thick, yellow cream. These microscopic particles exfoliate the dull surface to reveal fresh, clean, bright paint that shines like new. Poorboy’s World Medium Super Swirl Remover SSR2.5 is more than a polish but less than a compound. Rather than just cleaning the surface paint like a polish, it removes light to moderate imperfections to improve the paint’s texture. Unlike a compound that removes flaws but requires the use of a fine polish afterwards, SSR2.5 corrects and refines the paint in one step. You get the best of both worlds in one bottle! Poorboy’s World Natty’s Paste Wax (BLUE) is designed specifically to hide blemishes and scratches in dark paints. Patented UV light absorbers keep your paint fresh and protected throughout the life of the wax. You’ll love the way your paint looks and feels under Natty’s! Apply additional layers to increase the depth and glimmer. Poorboy’s World Spray & Gloss is a quick detailer with superior gloss enhancing properties. You’ll find the formula is very slick, which allows gritty particles to slide off without scratching your paint. Dust, dirt, fingerprints, and smudges wipe off instantly to uncover a just-waxed shine. The formula contains impressive gloss enhancing agents that really turn up your shine and improve the brightness and clarity of your paint. Poorboy’s Spray & Wipe Waterless Wash cleans your vehicle when you can’t wash it the old-fashioned way. It’s a step above what a quick detail spray can do, without the extra shine. Spray and Wipe Waterless Wash will quickly and completely revive a lightly dirty or dusty vehicle. A Lake Country CCS 6.5 inch Gray Finishing Pad has a composition is firm enough to withstand added pressure during final finishing to remove buffer swirls. It has no cut and will apply thin, even coats of waxes, sealants, and glazes. A Lake Country CCS 6.5 inch Orange Light Cutting Padis made of firm, high density foam for scratch and defect removal. Use this pad with polishes and swirl removers. It’s an all around pad that will work on most light to moderate imperfections. A Lake Country CCS 6.5 inch White Polishing Pad is made of high absorption foam formula for the application of swirl removers, polishes, and pre-wax cleaners. 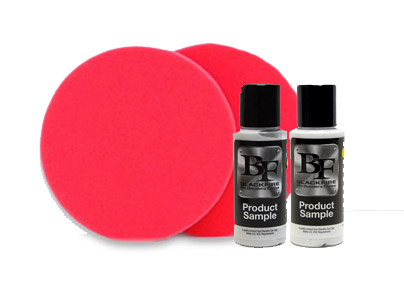 This pad has very light cutting power in order to gently clean and polish the paint surface for a glossy, smooth shine. Two 16 x 16 inch Cobra Microfiber Towels are spun from an 80/20 polyester/polyamide blend, producing a highly refined microfiber. The microscopic polyester/polyamide fibers are split with a unique process that creates a “feathered” weave on one side for buffing and looped fibers on the other side, which are excellent for cleaning. This superior “feather” weave results in far greater absorption properties in a virtually lint free network of fibers. A total retail value of $288.87. Save $28.88!